I love photographing the tulips at TulipFest every year. But last weekend had intermittent rainstorms, and I decided to wait until Monday to get the shots I wanted. And the shots I wanted … included shooting with an old vintage lens attachment. About eight years ago, I purchased a Kenko 180° front lens attachment, which allows me to snag photos with an almost bug’s-eye view. I took some test pictures with it … and then put the lens away. Maybe I took it out once or twice after that … but for all intents and purposes, the lens stayed on the shelf. So now it’s Monday, the day after TulipFest. If I want to capture beautiful tulip photos before the tulip petals wilt and fall away … today’s my only shot. I took the Nikon Df camera and a 50mm f/1.8 manual focus lens (also known in photo circles as the “Nifty Fifty”). And I attached the Kenko 180° lens to the front of the Nifty Fifty. Off to Washington Park I go. 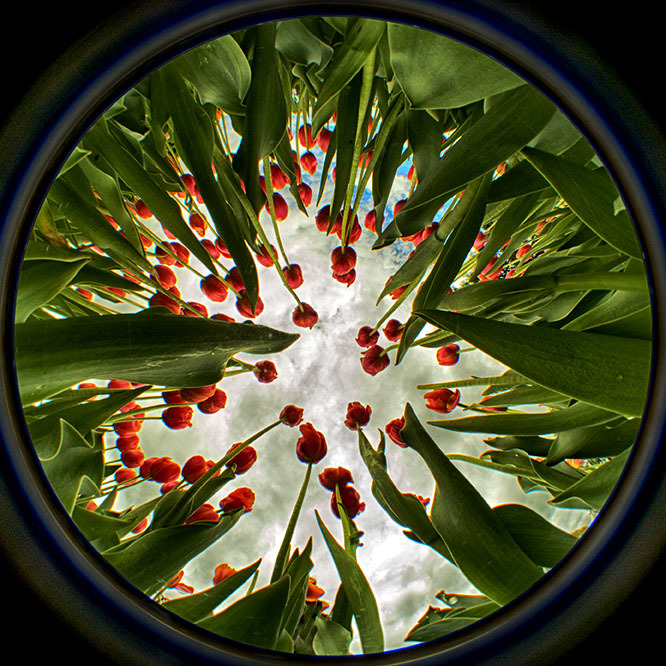 Rather than just photograph the flowers from above, I planned on putting the camera in the tulip garden. Yes. IN THE TULIP GARDEN. If I do this correctly, I should see the stems and petals and blooms above me, just as if I were a grasshopper looking up. A few test shots. In order to stay as far out of frame as possible, I attached a manual shutter release to the camera, and tried to hide behind some bushes. What the Grasshopper Saw. Nikon Df camera, Nikkor 50mm f/1.8 lens with Kenko 180° attachment. (c) Chuck Miller, all rights reserved. How about that? Finally got the Kenko 180° lens to give me an awesome photo. First place winner in my opinion Chuck! Beautiful!!!! What a stunning paperweight that would make.